Posted 11/16/2018 10:01am by Cherry Valley Organics. 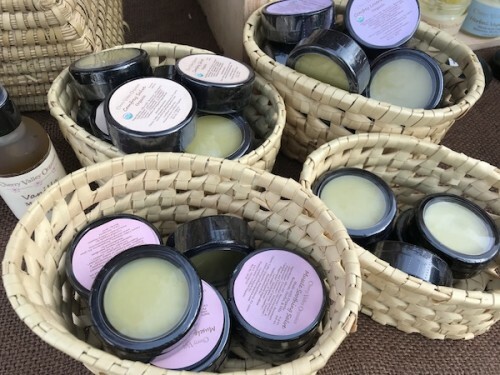 Herbal salves like those we make here at our certified organic farm are useful for soothing irritated muscles and healing damaged, chapped, or dry skin. Our salve recipes combine essential oils, herbs, and beeswax to create one of a kind blends. Like all of our products, our salves are certified organic by the USDA. Our herbal salves are handmade in small batches using organic ingredients. 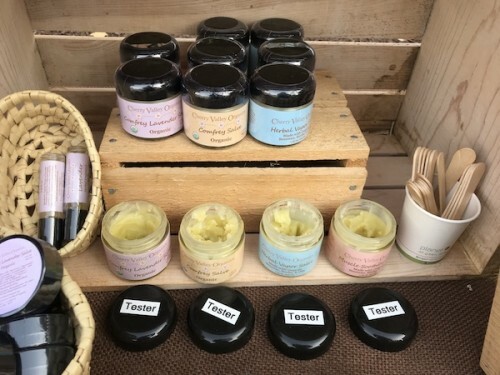 We offer four different salves, each of which has unique healing properties. All are made from a base of olive oil and beeswax infused with various herbs and fragrant oils. Comfrey Salve: Contains a blend of herbs known to heal small cuts and extra dry, cracked skin. Comfrey Lavender Salve: This fragrant salve includes lavender essential oil and extracts of herbs to repair damaged skin. Herbal Vapor Salve: Our organic answer to a popular brand of vapor rub is a combination of eucalyptus, camphor, and peppermint oils known to clear sinuses and ease breathing during cold and flu season. Muscle Soothing Salve: Combines cayenne, camphor, and arnica to create a muscle-soothing blend that soothes sore muscles after exercise or injury. Handcrafting herbal salves is an art that we take very seriously. Using only the highest quality oils and herbs grown right here on the farm, each batch is carefully crafted using the following technique. Step 1: Warm the carrier oil. First we create a double boiler by putting about 1.5-2" of water in a pot and turning the burner on medium-high heat. Then, we place a glass pouring jar into the pot and partially fill it with carrier oil. To minimize allergic reactions, we use olive oil as our carrier oil instead of a nut oil. Step 2: Select herbs for your salve. 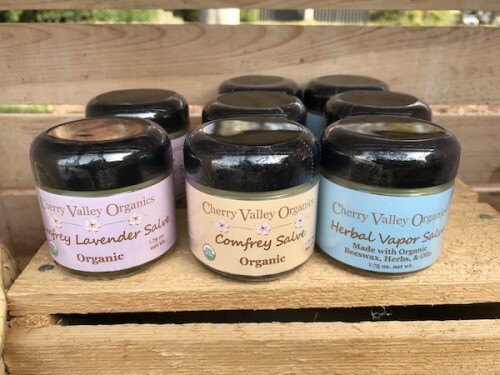 We use various blends of comfrey, lavender, calendula, chamomile, plantain, chickweed, and yarrow grown at the farm and selected for their skin-healing properties. The herbs are placed inside an unbleached, natural cotton muslin bag for easy removal, and then the bag is put into the carrier oil. An alternative option is to put the herbs directly into the oil and then strain the oil through cheesecloth when the herbs are ready for removal. We use fresh herbs if we have them available which gives the salve a slightly green tint, but dried herbs work well, too. Step 3: Infuse the oil with the herbs. Let the herbs steep in the warm oil for 1-2 hours. Be careful to replenish the water as it evaporates. The water should be heated to boiling initially and then turned down to simmer throughout the 1-2 hours. Step 4: Melt in the beeswax. After 1-2 hours passes, it's time to remove the bag of herbs. Then, beeswax is added to the oil and the mixture is heated until the beeswax is fully melted. Step 5: Add essential oils and a natural preservative. Once the beeswax is liquid, we add a preservative to keep the salve fresh (we use rosemary antioxidant from Mountain Rose Herbs). We also mix in essential oils to add fragrance at this time. Step 6: Pour into jars. After mixing in the essential oils, it's time to pour the finished liquid salve into glass jars. As the jars cool, the salve solidifies. Step 7: Put on the lid and label. As soon as the jars have fully cooled, it's time to put on the lids and labels. While the salve-making process isn't complicated, our quality recipes and herbal combinations make our salves the finest available. Extensive positive feedback from our customers tells us that they wholeheartedly agree! You'll find all of our salves available here. We also offer a Herbal Salve Gift Crate that contains three different salves in a rustic wooden crate.